Scooping her hand in the Crisco tin, "Scoop out about this much Crisco." Reaching down in the flour jar, "Now add a few handfuls of flour." "Then you add some salt and baking powder. And, you are done"
Needless to say, no one ever perfected those biscuits! We all tried, but never came close. I am not going to try to give you a biscuit recipe that would even come close to Granny's, but I do have a great homemade crescent roll recipe that is delicious and very easy! I will give you this disclaimer though, it is not a flaky, buttery crescent roll like you get from a can. It is more like a dinner roll that is rolled up. In fact that is what Miller calls them, Roll Ups. He has asked for Roll Ups every night since I made them. 1. Combine yeast and warm water in a 1 cup measuring cup; let stand 5 minutes. Combine 3 cups baking mix and sugar in a large bowl; gradually stir in yeast mixture. 2. If you have a heavy duty mixer (standing kitchen aide): Beat dough at medium speed using dough hook attachment, about 5 minutes, beating in 1/2 cup additional baking mix, if needed, until dough leaves the sides of the bowl and pulls together, becoming soft and smooth. 3. Roll dough into a circle (the recipe calls for a 12 inch circle - about the diameter of a rolling pin- but I thought this left the dough a little thick. Next time I make these I will probably roll my dough out a little bit more). 4. Cut circle into 12 wedges. 5. Roll up wedges, starting at wide end to form a crescent shap; place point side down on lightly greased baking sheet. 5. Cover and let rise in a warm place , free from drafts, 1 hour or until doubled in size. 6. Preheat oven to 425. Bake 10 to 12 minutes or until golden brown. Would be really good if topped with some melted butter before putting in oven or Parmesan cheese! Lately, it has been cold and the Lee Kids have been sick (mainly SW and Ella just a little) so we have been at home getting creative trying to find different things to do. One things we can always count on Ella and Miller loving is helping to cook. They have gotten to be quite the little chefs (tonight at dinner, Ella smelled her food and said, "mmmm Mommy there is cinnamon in there." Yes cinnamon has a very distinct smell, but I was super impressed that she picked it out on her own). A couple of nights ago Ella and Miller helped us make ravioli. I love the excitement and joy in Ella's little face in this picture. I don't know what took us so long, but we finally discovered how much fun it is to play in the garage. This is the kid's new favorite thing to do. And I love it because they are burning energy and I don't have to be freezing outside! Even Sara Wells even gets in on the fun. She can zoom around in her little walker and keep right up with Ella and Miller. I think this is obvious to say, but the kids love all things Toy Story. They act out scenes from Toy Story and they love indoctrinating Sara Wells on all things Toy Story (the other day I walked in the living room and they had her sitting down while they introduced her to all the characters). But the cutest thing they do is bring things from the movie into real life. For example, Ella talks about going to college all the time. The other day on the way to school she said, "Mommy, I don't want to turn six because when I turn six I will have to go to college and leave you and I will be so sad to leave you." As serious as I could I explained to Ella that she did not have to go to college until she was 18. Another idea from the movie that they have included in their everyday conversation is the idea of putting things in the attic. They get very concerned that I am going to put their toys in the attic. However, when I talk about giving toys away, they get very concerned and want to put them in the attic. It is pretty cute. The other day Murray had to put something in the attic and thought the kids would get a big kick out of getting up in the attic. Which they did, but what they (Miller in particular) loved even more is what Murray found. Murray found his old football helmet. Miller thought he was big stuff wearing his Daddy's helmet! Monday morning at 5:20 am my sweet grandmother went to be with the Lord. As my cousin said, she left us so early in the morning because Granddaddy told her it was time to go fishing! I can honestly say I have truly rejoiced with her as she has gone to be with the Lord. Granny has been trapped in her body and has been ready to praise the Lord in heaven for some time. Murray and I drove down to Auburndale Wednesday and spent the evening and next morning with my family telling story after story about Granny. I wish I could share them all with you. I left Auburndale amazed at how many people Granny poured her life into. Granny was possibly the hardest worker I know, getting to work at 5 or 6 in the morning, working all day, when her day at work was over she would go to my granddad's shoe shop and help him there until it was time to go home and get dinner ready. Every night cooked dinner for her 3 boys and 2 adopted nieces (fixing dinner included 2 meats, 3 or 4 vegetables and always homemade biscuits). Not only would she cook for them, but there was always friends from church joining the dinner table. She had her boys in church every time the doors were open and always had a meal or hot chocolate and dessert waiting for all the kids from church. She created a safe and welcoming place for them to always come. She instilled the truths of the Lord in her children. And not just in her family, if you sat down at her table, she made sure to share the importance having a personal faith in Jesus Christ. Two things about Granny that I hope to always remember and is true of my life. As hard as Granny worked, she never used that as an excuse to not serve her family and those in the community. I know my tendency, after working all day often at two place, I would want to come home and not do anything else. But Granny always poured her life into others. She always sacrificed her time to love others well. Also, as hard as Granny worked and as much as she juggled at home to keep everyone clothed, fed and to the right place at the right time, she made an extra effort to do special fun things with her boys. My dad remembers special fishing trips with just the two of them. I tend to get caught up in the cooking, cleaning, laundry, running here and there and forget how important it is to also have fun with my kids and let them know they are so special to me. Granny always made a special effort for each of her children and grandchildren to know how special they were to her. 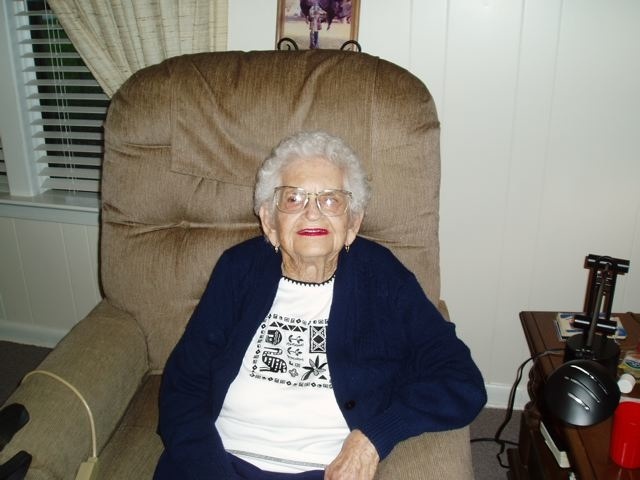 I will always miss Granny, but I know with confidence that I will see her one day in Heaven! Friday night after Miller's birthday party I took down all the blue and green and pulled out the pink. By Saturday morning there was no sign of a Buzz Lightyear Birthday Party, it was all pink in the Lee House! I had a lot of fun with a few really simple decorations (more to come on these later). Sara Wells had a very sweet 1st Birthday Party. I stopped putting out any type of centerpieces on our dinning room table when Miller was about one. They were just an invitation for the kids to climb on the table and break something. Finally, I realized it was just not worth the frustration. I gave up having centerpieces for a time. Recently the kids have really gotten into decorations and keep reminding me that we need "decorations" on the table to make it look "beautiful." They were so disappointed the day that we took our Christmas decorations down. Then they were filled with excitement two weeks later as we started getting all the decorations for the birthday parties. When I saw the gloom that covered their faces as I took down the party decorations, I remembered this wreath I had just seen on Tatertots and Jello. So, I made their little faces bright again with the promise of Valentine decorations. This wreath was extremely easy to make! I had an old twig wreath that I decided would work just as good as the suggested foam wreath. Honestly, I really liked the way that it turned out with this wreath. Then I got three packages of Valentine cupcake holders and some red and white ribbon. The best plan of attack is to work on sections at a time so that you do not have any big holes. I just bunched up the cupcake holder and put hot glue at the base. Then stuck it in the wreath where I wanted it. Ella got very good and folding the cupcake holders. Since she is too little to be using a hot glue gun, she was the official cupcake holder folder. What is so great about this wreath is that you really cannot mess it up! Ella had a blast. After you have filled in the wreath, check for any holes and fill in. I used all three packages of cupcake holders (150). I then glued the ribbon around the twig in the back. The wreath probably took about 11/2 hours (would not take as long without a little helper, but also would not be nearly as much fun). It makes me happy every time I pull into the driveway and see it on our front door. Ella and Miller were not satisfied with just a wreath on the door. So Thursday we went out searching for a few more fun things. Ella and Miller loved garland hanging over the fireplace (not ours, because I did not get it this year, but in all the movies and books) so I thought they would get a kick out of having Valentine decorations hanging on the fireplace. With 4 pieces of 1/4 yard fabrics you can make this, so easy! I cut out different sized hearts and just glued them right on the twine. I had a few left over that we hung from the chandelier over the table. Nothing fancy, actually a little tacky, but it brought smiles to the kids faces and we had fun together! Let me start off by saying that Miller has been talking about this birthday party since the day after his birthday party last year (his birthday party last year was the day Sara Wells came home from the hospital with our family). Needless to say, there has been a lot of build up about this birthday party. Initially Miller wanted a Cars birthday party, but since the first time that Miller saw Toy Story all he could talk about is his Toy Story Birthday Party. As I started thinking about his party, I began to wonder what we would do. Honestly I just wanted to go to I-Jump or something easy where you just show up and they take care of it. However, Miller is a bit of an introvert and he would just take off by himself and not care about any of his friends who were there. So, I had to get a little bit more creative. The Evil Emperor Zurg captured Woody and his gang. Miller and his friends had to rescue Woody and the gang. When they first arrived, they decorated bags that they could collect things throughout the rescue mission. Murray gathered all the kids and took them downstairs for their first mission. Zurg captured Slinky the dog and entrapped Slinky in layers of his evil force field (aluminum foil). The force field lost its power when the music stopped (just think hot potato with aluminum foil). Next we were off to the garage where Zurg had partnered up with Stinky Pete and captured Woody. The kids had to shoot down all the Stinky Pete's until they found the water bottle where Stinky Pete was holding Woody hostage. Next it was out to the driveway where the Army Men were trapped in sand as they were on their way to rescue Buzz and Woody. Then they had to find and rescue Buzz from Zurg's helium bubbles. And finally, they had the chance to defeat Zurg himself! We opened the garage door and there was Zurg (pinata) hanging from the ceiling. When we got upstairs for pizza, all Miller wanted to do was eat his candy (of course). He unwrapped all of his chocolate candy and ate most of it before I could stop him. I am still in shock that the kids actually did everything. I was fully prepared for full chaos. But they not only played the games, they loved them! Happy Birthday Miller! We love you...To Infinity and Beyond!